WifiRanger is proud to sponsor this article. As many can attest too, having free WiFi and a strong and usable WiFi signal at the campground are two different matters. For instance, what can determine the strength of a signal is the distance from the connection point. The further away you are from the connection point (usually at park office), the weaker the WiFi connection will be. Another factor is the bandwidth that is available at any given park. If there isn’t sufficient bandwidth compared to the number of RVers that using the WiFi, the signal strength may be strong but the connection to the internet can be slow. The contents of the Elite Pack FM system. Sorenson explained that the WiFiRanger, which was introduced in 2010 and is now in its fourth generation, is a wireless Internet router that works in conjunction with a high-gain roof-top antenna to receive stronger signals from an RV park’s connection point or other surrounding signals in the area. The router is also designed to add a layer of security with a firewall and WPA encryption. In fact, one of the unique functions in the system, according to Sorenson, is the Safe Surf feature. This allows RVers to toggle on and off an even stronger layer of security, which encrypts all of the data in a secure tunnel. What this means is it encapsulates all of it so if hackers are lingering, the ability to un-encrypt that data is greatly reduced. When RV Life spoke to WiFi Ranger representatives, the company was considerate in providing a 5% discount code for RV Life readers when purchasing the WiFiRanger from its website. The discount code is RVLIFE5. A testament to this is when Weiss was in a remote region of Death Valley National Park Nevada where no cellular service was available. The only service related to WiFi was a satellite link, which he was told was only accessible in the campground office. Determined, Weiss returned to his RV and sure enough–after putting the system to the test–he received a signal. 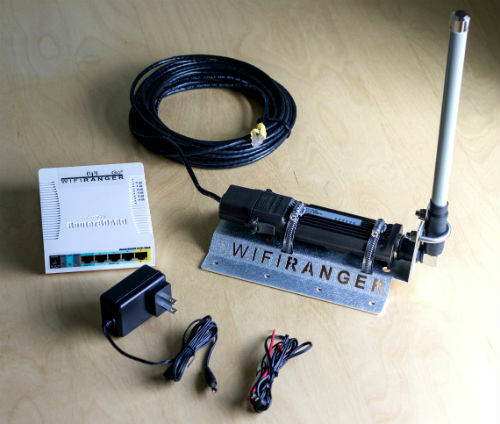 When WiFi is not available, the WiFiRanger can also conveniently tether a cellular connection from iPhones, Androids, USB air cards, as well as MiFi devices via the featured USB port. Three models of the WiFiRanger are available. There’s the WiFiRanger Mini Pack, WiFiRanger Elite Pack and the WiFiRanger Elite Pack FM (Flat Mount). While the Mini Pack has a 2500-foot range, the Elite Pack and the Elite Pack FM have a maximum range of two miles (in the most ideal conditions). Create a secure network for all of your devices. Offer support for cellular tethering through a USB port. The ability to tracks data usage and restriction rules. When it comes to mounting and installing the indoor WiFiRanger Go2, the plug and play system measures no more than 5 x 4 x 1 inches can be stored practically anywhere in an RV. While the roof-mounted component on the Mini Pack measures eight inches tall, the exterior component with the FM Elite models is 13 inches. Those with newer RVs that have higher rooflines (that measure 13.5 inches or taller) should consider the available Pole Mount model Elite Pack that can be mounted in various locations outside of the RV. All details and parts of the system, too, have been thought through as well to provide reliability for the rugged outdoor environment. For example, the Ethernet cables and grommets are all rated for outdoor use, while the connectors are IP67-rated, which means they can withstand wet, inclement weather. As Weiss explained, it has been his experience that some RV park owners have considered WiFi as an afterthought in recent years but that scenario is currently changing in the RV park community. 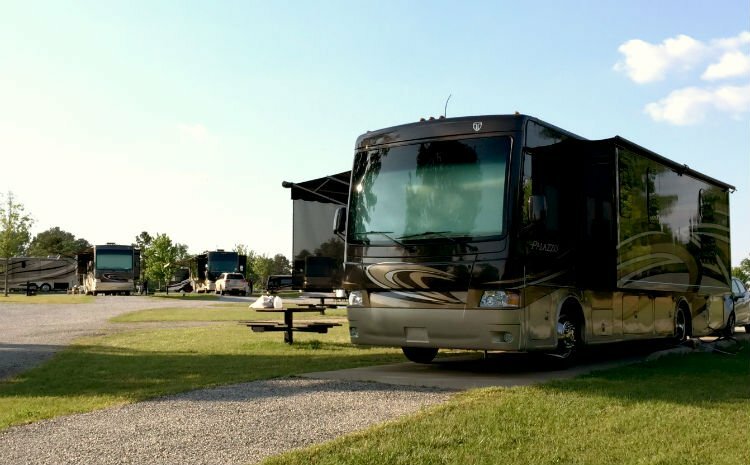 In the interim, WiFi does remain available and even if RVers experience weak signals in some areas, the WiFiRanger is able to reach the RV park’s signal or signals from nearby businesses. For more details on support visit these how-to videos to address any of your concerns. For a whole lot less money I went to ccrane and got an omni directional wifi antenna, and attached it above the roof of my rig. Then I got cable there to attach the antenna to my ALFA USB wifi adapter. The ALFA attaches to my laptop in a USB port…. I get a striong signal when people just using a laptop don’t get one at all. Total cost around $60.00 which includes antenna, cable and ALFA. I’m with you I’ve been using the ALFA for a few years now. I use the R36 wifi router with the ALFA AWUS036H Long Range USB Adaptor, All my devices hook to the r36. I have the same setup. I found adding a usb powered hub between the alpha usb adapter and R36 helped a lot. Have a flat panel antenna connected to my TV post on top of the RV which allows me to aim it from the inside. In the process of adding 3 ft in height so my antenna can get signals past the huge class A’s that park beside me sometimes. Can easily connect to an Xfinity hotspot that is 175 meters away and still use netflixs. Last week I was 250 meters away and still could get internet but not good enough for netflixs. With a higher antenna I sure it will be better. That is what I have been using for over 10 years. It works great! I can not see spending hundreds more could be worth it. Do you have to have the RV park’s wifi security code to access a router? I have the titanium pack, the predecessor to the elite and it works well. Yes, you do have to have the RV park security code or splash screen for it to work. Originally the WiFi Rangers would choke at that point but now they have the intelligent software that knows when the splash screen is needed and takes you to it to enter it. Wifi signal is NOT the problem, at least in most RV parks. In almost every case of slow Internet, the problem is the park’s connection to the Internet. Boosting wifi signal will do nothing to help that. If you want good, fast, strong Internet on the road, a wifi/cellular router from the cellular provider of your choice is the only game in town. I worked from the road for almost a year without resorting to buying an ATT hotspot. I used a $50 powered directonal antenna to get better signal, it does make a difference and it’s much cheaper than the $50 per month that the hotspot cost. FIFTY BUCKS A MONTH??? Holy cow. My Verizon cellular-to-wifi router cost $200 (not per month, $200 total), and the special antenna I bought for it was an extra $70. I see that Verizon, like AT&T, charges $50 a month for it if you don’t buy it outright. Uff Da. The damn thing only costs $200. Maybe the fifty bucks includes a few GBs on a data plan, I don’t know. And you WILL have to buy a data plan. Verizon used to make an external antenna for it, which I snagged right away because I was warned they were going to quit making them. I guess I was warned correctly, because I can’t find anything of the sort now. I see lots of 3rd-party ones on the Internet. Maybe they actually work, I don’t know. All but one of them look pretty impractical for an RV. I would say the first step is to find out if your cell phone has tethering capabilities. Basically you can turn you cell phone into a router and you may already be paying for it in your data plan- often in Verizon, ATT plans. It is counted against your data but you can always use it when you want. A recent comparison on speed found the cell phone actually faster than a dedicated hot spot! If your cell phone does not offer tethering or your plan then you may not have a choice. Thing is, it is cheaper than having a device monthly payment additionally. I agree about poor signal strength, not receiver issues. I was 100 feet from a tower in Mesa, AZ and no WIFI. When the park got rid of Tengointernet the next year there was no problem connecting with the same computer setup. I also stopped using the outrageously expensive ATT hotspot because it was price gouging. I usually don’t have a problem these days receiving WIFI, and when I do, such as in Clifton AZ RV park, I wonder if the powered antenna would make a difference? Might need to try it. What Ken said above is the case. I made the southwest tour of National Parks this year in July (2016) and then to the Pacific northwest. We stayed at major RV parks along the way. In every case they had WiFi and in most the signal was good through the park. But the service was unusable in the morning and evenings and poor the rest of the time. I think that we are at a point that the parks should publish the capacity of the wifi (how many Mb is available) and the typical “Ping” time to a know site such as Google. I understand that due to the location of many parks the availability of high speed internet is limited or non existing and only available via Satellite. This information is important to me when planning a trip. It is true that this year the only usable internet was the hotspot on my cell phone. Great suggestion Gary – I couldn’t agree more on having the parks publish information about heir capacity. The problem with publishing speeds is that they can vary based on MANY conditions, including weather, number of users, and the type of content being requested from minute to minute. In one of the parks I manage the wifi in the average speed at all sites is around 5 mbps. But that can vary from a high of 32 mbps, to a low of nothing, if there is an equipment issue at one of the eight APs. Plus if you advertise something people will be very upset if they don’t get EXACTLY that at all times. And noone can guarantee that. I think we have come to the point at which RV parks are going to have to get out of the Internet Provider biz. With the kinds of content that most Internet users are consuming, RV parks simply cannot afford the kind of “fat pipe” to supply all that to dozens of RVs, all with multiple devices, parked in their lot. Even a small RV park (say, a couple of dozen spaces) would need a pipe with hundreds of mbps capacity — and that is EXPEN$$$IVE. Larger parks would need a pipe to the outside in the gigabits per second. Equipment for that kind of throughput also requires a technical staff to maintain it. If you’re at a park that can do all that, you are going to PAY through the nose. I have used the Jefa-Tech RV antenna now for 8 Years. I can receive a good wi-fi signal up to one half mile. The antenna with cables cost $110.00, there is no need for electric power, and the software can show you all wi-fi stations that are available to you. Look at http://www.jefa-tech.com and search for RV wi-fi antenna. Excellent product, right price. Unfortunately, these devices can actually contribute to the Wi-Fi problem in RV Parks rather than helping. If they lock onto a nearby McDonalds then it may not be an issue (as long as it is not using the same channel as the RV Park). If they lock onto the Park’s Wi-Fi Network using full power then they can easily cause problems and actually degrade the performance of the Park’s Wi-Fi Network for everyone. These units are essentially high-powered antennas/repeaters/boosters that can overwhelm and interfere with the park’s Wi-Fi network. This is especially true if the Park only has a 2.4GHz Wi-Fi network. These devices can cause co-channel interference (caused by two different radio transmitters using the same frequency). A lot of people think that boosters and repeaters are the answer to poor Wi-Fi performance. In reality, that is not usually the solution. The solution is to have a properly designed Wi-Fi network for the park using dual-band radios with sufficient coverage and capacity (both wired and wireless) plus managing the RF Spectrum for “co-existence”. Agreed. The omni antenna is an extremely poor solution for the RV-side wifi unit. The product shown seems to be a lashup of MikroTik’s 951 and Metal units, plus some preconfiguration, at about four times the retail price. A better choice would be the SXT lite2, at $50 — it’s directional (reducing interference both received by you and caused by you, including to households outside the park), and has all the same VPN tunneling capability advertised. I’ve used one of these for years and it works just great from *inside* my rig, no need to punch holes in the roof or mount, or subject it to heat or weather. For the indoor WiFi unit, a mAP 2n ($45) is perfect for an RV and also provides electrical power to the SXT. That is all well and good if you are a networking engineer. But for most users having preconfigured capabilities is important. What you say is accurate, and being a networking person I have no trouble configuring the units and then managing them later when things go wrong. But most users cannot deal well with issues. where can I get this setup? I fully agree with all of the three above. I’m an IT person and the issue is generally not the signal. It is the bandwidth and initial speed. I understand that campgrounds don’t want to pay a lot for internet, but guess what? They are going to have to! It’s what people want, and in fact need. We stayed at a great little campground that had upgraded their internet. The park was full, the signal strength was amazing, and the speed? Incredible! One of the things it did was disconnect you after ten minutes if you were not actively using it. That worked for me, and I think it’s s a great way to give the extra bandwidth to someone else. It connected when I got on again without making me sign in again. This was a sweet solution. I’d gladly pay a bit more for decent internet as sometimes there is no cell service in some of these places so I cannot use my hotspot. Which, BYW, would be more expensive than campground internet. Thx for the tip about crane, Hunter Hampton. Yes, there are a number of methods to snag a better wifi signal. PEPWave and Cradelpoint routers have WAN as wifi capability as well as external antenna connections. We use both of these routers and dedicate a PEPWave Surf 400 for wifi snagging. All said, the major problem that we have with park wifi’s is that they throttle the bandwidth. Pretty much guaranteed that TengoNet parks all throttle. Most of the parks that we have stayed in throttle. Equally, even many of the coffee shops are throttling. When we installed the Surf400, many of the places had not throttled and now do. These places are now running at 1-3 Mbps download speed. My message is that we rarely use local wifi at parks because of throttling. Before you spend money to setup a system and go through the install, please be aware that more then likely, it will be a very slow avenue to the internet. Fine if you are just emailing, but not good for anything else. We are currently getting >35 Mbps using a cell connection with Verizon. Bad news is that it is expensive and we have to be careful going over our monthly limit. Over the past few years I’ve noticed signal strength improving in a lot of the campgrounds that I frequent. What good does a strong signal mean if what I call “Bandwidth Hogs” take up what little bandwidth is available in the parks to download movies. I’ve noticed that when I check into a park around 2:30 or 3 each day, the WiFi is pretty good. As the park fills up, the connectivity goes way down as the “Netflixers” gobble up what little bandwidth is available. I use my internet connection to read emails and newspapers articles. Those that watch movies via the internet should be pushed off onto higher capacity connection and pay a premium. Some parks automatically disconnect the internet connection every 15 or 30 minutes to prevent the overloading of their WiFi by movie watchers. WiFi connection speed depends on the received signal strength at each end as well as the number of current connections on each access point (bandwidth is time-shared on an access point). It take 100 times higher received signal strength for the highest WiFi speed than it does for the slowest WiFi connection, as the higher speeds use different modulation formats involving different levels of receive strength as a way to stuff more data into each symbol. The access point and the connected device renegotiate the connection speeds as often as several times a second in order to achieve the highest data throughput, but the need for high receive signal strength coupled with much lower transmit power puts the exploding users of handheld devices (tablets, smart phones, ebook readers, etc.) at a great disadvantage when trying to connect to an access point further than 30-50′ away. Handheld devices can often hear a WiFi access point well, but with only about 1/100 of the transmit power to reply back, can’t be heard or are “stepped on” by other stronger devices. If they can connect at all, it’s often at a very low speed, and slows everyone else on that access point down as well, waiting for the slow device. A WiFi Router, such as a PepWave, WiFi Ranger, Cradlepoint, and the like, can be of great benefit to these low power devices. But, it must be a “router,” not a “booster,” as a simple inexpensive “booster” repeats everyone and everything and really overloads a park’s WiFi system, exacerbating the problem. Another problem, that we really can’t do much about, is the exploding use of bandwidth-hogging video ads that are included on many web pages. In the parks where I have designed and installed the WiFi systems, we use intelligent gateways to throttle down to a reasonable rate only those devices that are hogging bandwidth by streaming video, and thus leave more bandwidth for others to share. Unfortunately, some parks are far enough out have no access to high speed ISP feed(s) and thus have very little bandwidth to share in the first place. We do the same to a desktop in our 5th wheel. I then us software called Connectify Hotspot Pro, which was relatively cheap upgrade from the free version, to create a hotspot in the trailer. It works great for us. I weather-proofed my Crane antenna and made a mount on the ladder for it. I take it down to drive so I invented a quick mount and dismount for the antenna. I just run the cable out the window. I was excited until I saw the $400 price tag. Think I’ll stick with my 4G hotspot. Try my system Bill. It is a good way to stretch out your time on the 4G and works in a pinch when you do not get 4G reception. I have even used the Connectify Hotspot to share my cel that had better reception when placed in a window somewhere. I stayed at an RV park in Palm Desert that had limited free bandwidth but for $20 a week I could get all the bandwidth I needed. I think that is the way to go. Let the people who use lots of bandwidth pay for it and those that only use email can have the free system. We did a tour from Indiana through the Southwest, up the West Coast and back across the Northwest and Central States. We stayed at all types of costly Campgrounds, minimum requirements types, and even some boon docking at WalMarts. The best WiFi we received was at many of the WalMarts. All of the upscale campgrounds which advertised WiFi, failed to deliver! It really soured us on paying to receive WiFi which was not delivered. At one campground in Southern California their comment was. ” they had not had WiFi service for over six months.” At $60 per night I considered this to be false advertisement, but they were only one of many that failed to deliver. I would have rather paid WalMart to camp on their lot than to have been lied to by some pretty fancy Campgrounds. Unfortunately over-/misuse of devices like this can make matters much worse for someone/everyone else. I’ve been working with radios/RF for over 40 years (yes, WiFi is radio) and I.T. for over 20, and have a few books out, one of which is specific to WiFi issues. If you want to see how bad this can be, download an app like WiFi Analyzer (Android) to ‘see’ how many WiFi signals are on the channels, overlap across channels, etc. 2. If the camp hotspot is on CH 1 and you put up a “jetpack” cell modem or tether from your phone out onto Ch 1 then you cause interference for someone else trying to use the original hotspot. 3. WiFi repeaters, units that for example associate with a source hotspot on Channel 11 and then re-broadcast on Channel 11 definitely overlap and interfere – others trying to use the original hotspot directly get jammed by the repeater re-using the same channel. If the repeater re-broadcasts from say Ch 11 to Ch 6, then you end up blocking access to another source hotspot on Ch 6. Just a mess. Worse if you’re using a unit like this that claims and if it indeed puts out 1000mW/1watt, = 10x the output of legal WiFi devices so you end up swamping signals around you for your own private wants. And to one of the comments – what is a “powered long range antenna” ?? There are slightly more involved but friendlier ways to effect this for FAR less $$ and not jam up everyone else with a $500 over-powered gadget. It involves using a WiFi-to-Ethernet bridge (preferably one you can add a directional antenna to so you can focus on the donor hotspot) to act as the client of the local hotspot, then bring attach the Ethernet connection to the Ethernet port of a WiFi access point or router INSIDE your rig and make a hotspot to cover locally without jacking up everyone else’s outside connection. Each item costs about $40 or so, plus cables. Keeping your private WiFi hotspot inside the rig helps shield it from others. You wouldn’t be pleased if someone else using one of these things blocked you out, so… think about it. I have found that most campgrounds have too many devices trying to access too few resources making for slow to non-usable WiFi. While a booster may give a signal strength advantage in both directions, I have found, on most occasions, it really doesn’t improve the pitiful campground WiFi experience. I usually resort to using my cellular data plan just to check & send basic email. I use WifiRanger products and have found I often get better results connecting direct to the campgrounds access points. I have come to believe that a lot of campgrounds advertise they have WiFi just so they can say they have it, but don’t have the funds or knowledge to invest in a working system. Most folks I talk to just use their expensive cellular data plan. I bought one and the difference is simply between NO WiFi access and streaming Netflix and YouTube with The Ranger Elite. I really like this article, partly because I purchased the WifiRanger two years ago when we started full timing across the country, and mostly because this is MY MOTORCOACH in the photo! Sweet! a 2014 THor Palazzo 33.3 …. nice. The photo was one that I took while at the Thor Motorcoach rally at Callaway Gardens RV Resort(Pine Mountain) Georgia last year. I had uploaded it to iRV2.com as part of my ‘where is my coach this week’ type of chat subject that many of us Palazzo owners contribute to. iRV2.com apparently forwarded this to RVlife.com for a contributing photo for the article – and it makes ‘sense’ since the very tiny barely visible top of my WifiRanger antenna is mounted on the front of the forward a/c unit on the roof. See if you can find it! and, no, it’s not the easy to spot antenna on the front of the roof, but the small dot further back – I mounted it there and ran the coax cable down the right side and into the top of the main slide top corner seal. Has worked very well there for 40,000 miles.